The RB-BTS Day "Inspiring Us Together to Act, Give, Learn & Grow"
On May 10, came together various corporate people, home makers, moms, retired professionals and children under one roof – The Raj Bhowmik Back To Society Day to do something together – It was about opening their hearts & minds to connecting, to learn, give and receive. 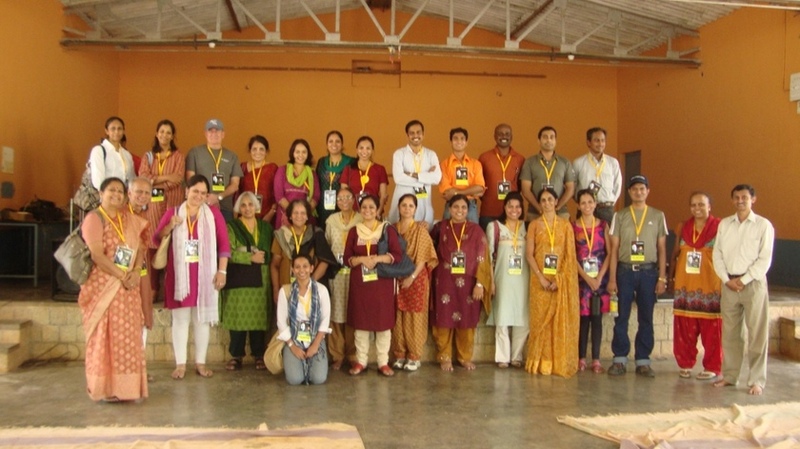 A group of 30 RB-BTS DREAM volunteers from Bangalore came together as a family for the very first time and extended a helping hand to reach out to 150 children from the 18 villages of Sriramanahalli at the People’s Trust Campus Bangalore. They were ranging from Age 10 – 15 and were excited, happy and eager to learn. Most RB-BTS Day Volunteers came by thinking that this is where they would impact & teach skills. But as one of them said, “We were humbled by what we received. So much that it has created a Stillness inside me even after 2 days”. I like children and just being around. I enjoyed the activity that I was part of. I also come from a village background and saw myself being one among them. The RB-BTS Day was organized well and everything was under control. I enjoyed being part of this experience. Working with children was good & useful for them. The RB-BTS Day is a worthwhile endeavor. With regard to the yesterday event "RB-BTS Dream", I would like to thank you for doing the great job in coordinating the event. I cherished each & every moment of this event. All of the eight activities were thoughtfully planned & executed. We did it in unconventional manner & ensured the maximum participation from the children. 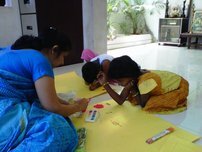 It was lovely to see children enjoying the activities & was thinking in innovative ways to complete the tasks. I would like Mr. Raj Bhowmik for such a wonderful initiative. Every time I am attending a BTS initiative I learn and heal some part of me. This time I felt closer to children and enjoyed the environment. Felt transparent and free. children are true image of the soul and being with them is a reflection of our soul. I learned to “to be” with them. I feel by being with them and give back to society has helped me in balancing myself and respecting and most significantly having gratitude and compassion towards the environment. There were no inhibitions about being with children. I was one among them and very much at ease. The global perspective is the synergy happening and everybody sharing ourselves without inhibitions. It was moving to see so many people who took time out to do this together. The kids participating, their love and love touched me. I feel connected to this ocean of Compassion. I feel I am part of this family and very happy and glad to be a part of it. Lot of people are doing such good work and lots to learn from everybody. I want to be a part of this every year from where ever I am. I would like to say Thank You to the RB-BTS Day platform and Sri Raj Bhowmik. Its awesome. Very glad to be here. I wriggled my way into it with all my heart. The more that I know about Him, I feel Incredible. He is Unique. He is a Master because He is so full of it. People have busy schedules but yet have time to appreciate each other. The world still has lot of nice people who contribute in a nice and genuine way. Each and everybody was doing so much effort 100%. Thank you for providing service on our platter. The day, the moment, the gift(the power to Dream); the occasion was completely a soul binding experience. Thank you for the opportunity of allowing the children feel the power to dream and also execute. Thank you for making us the tool .Thank you Raj for your abundant compassion, grace and presence.